"soulmotion" can thereby connect us directly with the essence of our being and the blissful feeling of unity consciousness all around. Many people struggle with finding stillness and therefore have resistance to meditating. It is a widely held view that mastery comes only after many years of studious practice. "soulmotion" is different in that it offers a direct and straightforward way of going inwards through basic movements that people of all ages and abilities can derive benefit from immediately. Through simple to learn movements synchronised with breathing, we connect with the source of all life and channel unity consciousness - Chi - through our bodies to bring upliftment, healing, rejuvenation, release from energetic blockages and greater self realisation. Crucially, the meditation 'turns up the volume of the soul' so we can hear it much more strongly in our lives. Although it has similarities to Yoga and Tai Chi, with "soulmotion" there is no 'right' or 'wrong' way of doing the exercises. Instead people are caused to connect with the essence of their being by performing the guided movements in their own unique way. Practitioners experience profound joy in finding and expressing their true nature. This accelerates our spiritual evolution and the bodymind is rejuvenated. Unlike many self realisation tools, the basics of "soulmotion" can be learned in the space of a few hours. 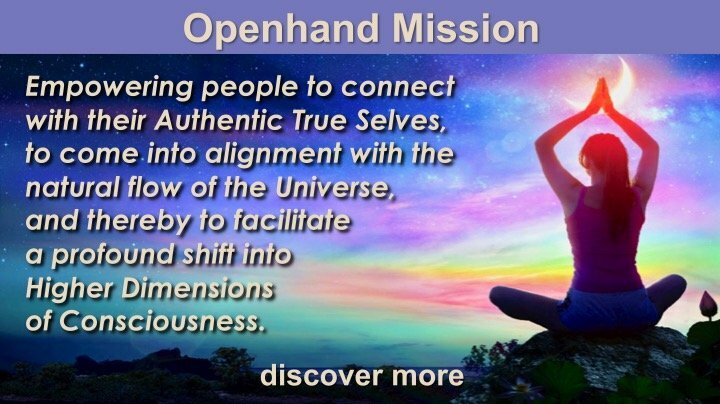 You can engage at a surface level for immediate rejuvenation, but as you venture deeper into the Openhand work, you’ll discover several further levels which can take you ever deeper into the profound nature of the self. "soulmotion" works hand in hand with our core philosophy - the 5GATEWAYS routemap - by helping remove energetic blockages we encounter on the journey. And it supports Openway" - your spiritual compass for walking the path in day-to-day life by making the 'quiet voice of the soul' louder. "soulmotion" is taught extensively on our courses.